Sure, the advertiser can click "opt out" but this is going directly to advertisers that may or may not be using an agency and who pays an agency a fee to manage their campaigns. 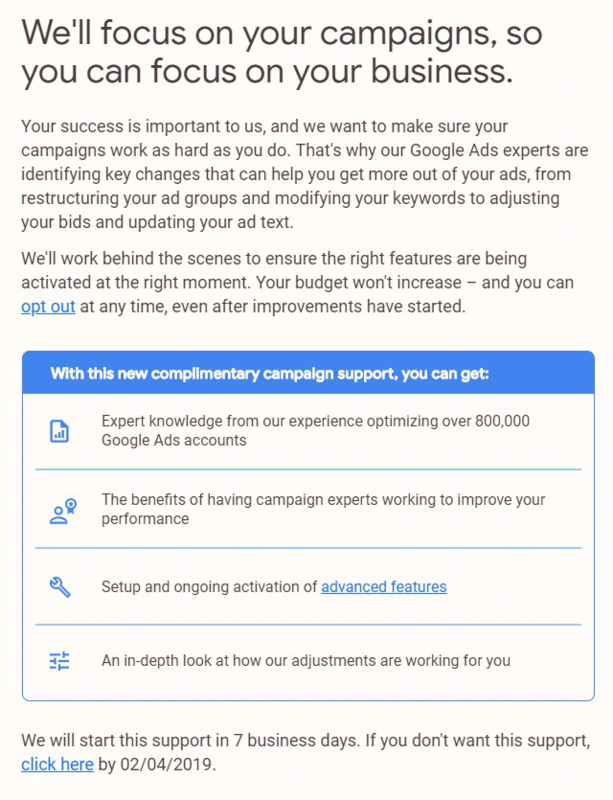 Not only is Google offering to do it for free, not going is Google saying these changes may or may not help (no guarantees), but Google is requiring these advertisers to specifically click a button to opt out of it, otherwise, they will be opted in by default. So if they miss the email, or they mark it as spam, then guess what, Google will take over and it will cause some pretty big issues for the agency. Again, we report on things similar to this, but opt in, not opt out, for years. Here are some of our reports from 2013, 2011 and 2005 but it happens way more often.